Look what I pulled out of the garden this morning! 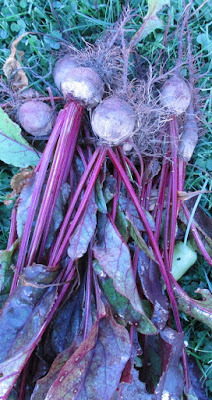 Some Detroit red beets that we replanted after the ground hog made it's way through our garden. Just enough to make a couple of pints of pickled beets. I also picked some banana peppers. We have decided that we love banana peppers. I love the way they taste (a little sweeter than a green) and they way they produce. Four plants of these peppers have produced great peppers earlier, stayed producing longer, and have a greater yield than my green pepper plants. A trial run that my husband wanted to do. They will be a keeper for next years garden. My husband has informed me that I have one more week in the garden. He wants to plow and is worried about rains that usually come in the Fall. So I will be cleaning up some this weekend and hope that I will have one more harvest. Seriously I think he just wants to try out his old tractor he rebuilt! How's your garden is it over?